Situated in Hohenstein, this property is 3.4 mi (5.5 km) from Walkenried Abbey and within 12 mi (20 km) of South Harz Nature Park and Unicorn Cave Prehistoric Burial Site. Grenzlandschaft and Museum Sorge and Wernrode Church are also within 20 mi (32 km). This family-friendly Bad Sachsa resort is located in the mountains, 3.1 mi (5 km) from Walkenried Abbey, and within 12 mi (20 km) of Unicorn Cave Prehistoric Burial Site and South Harz Nature Park. Wurmberg Gondola and Grenzlandschaft and Museum Sorge are also within 16 mi (25 km). Bad Sachsa Station is 8 minutes by foot. 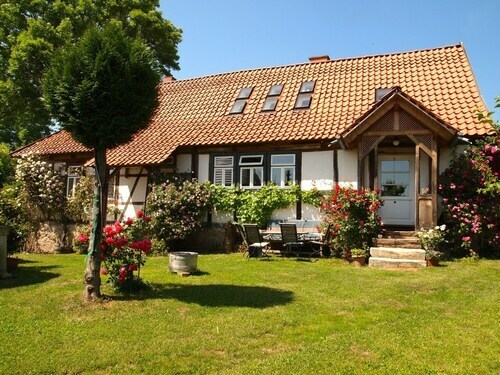 Located in a rural location, this family-friendly vacation home is 3.6 mi (5.9 km) from Walkenried Abbey and 7.4 mi (12 km) from South Harz Nature Park. Unicorn Cave Prehistoric Burial Site and Wurmberg Gondola are also within 20 mi (32 km). Situated in a rural location, this property is 5.2 mi (8.4 km) from Walkenried Abbey and within 12 mi (20 km) of South Harz Nature Park and Unicorn Cave Prehistoric Burial Site. Wernrode Church and Wurmberg Gondola are also within 20 mi (32 km). Situated in Walkenried, this property is 0.3 mi (0.5 km) from Walkenried Abbey and 4.2 mi (6.8 km) from South Harz Nature Park. Grenzlandschaft and Museum Sorge and Wurmberg Gondola are also within 16 mi (25 km). Walkenried Station is 6 minutes by foot. Situated in a rural location, this property is 0.5 mi (0.8 km) from Walkenried Abbey and 4.3 mi (6.8 km) from South Harz Nature Park. Unicorn Cave Prehistoric Burial Site and Grenzlandschaft and Museum Sorge are also within 16 mi (25 km). Walkenried Station is only a 2-minute walk. Situated in Walkenried, this property is 0.1 mi (0.2 km) from Walkenried Abbey and 4.3 mi (6.9 km) from South Harz Nature Park. Grenzlandschaft and Museum Sorge and Wurmberg Gondola are also within 16 mi (25 km). Walkenried Station is 11 minutes by foot. 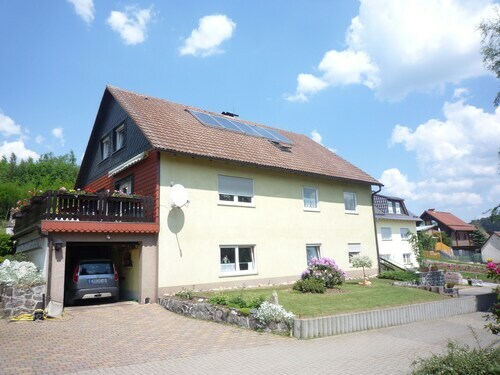 Situated in Walkenried, this property is 0.2 mi (0.3 km) from Walkenried Abbey and 4.4 mi (7 km) from South Harz Nature Park. Unicorn Cave Prehistoric Burial Site and Grenzlandschaft and Museum Sorge are also within 16 mi (25 km). Walkenried Station is 13 minutes by foot. Apartment Ground Floor - Apartment "krueger"
Situated in a rural location, this property is 0.5 mi (0.8 km) from Walkenried Abbey and 4 mi (6.4 km) from South Harz Nature Park. Unicorn Cave Prehistoric Burial Site and Grenzlandschaft and Museum Sorge are also within 16 mi (25 km). Walkenried Station is 7 minutes by foot. Get a culture fix at DDR-Museum, which provides an entertaining and rewarding experience for visitors. If you do decide to check it out, your travels will take you to Hohenstein, 45 miles (72 kilometers) outside of the capital of the state, Erfurt. You won’t be left out in the cold when trying to book accommodation close to DDR-Museum. You'll discover 4 hotels within an easy commute. You should add the Hotel Waldsegler Garni and Ferien Hotel Südharz to your list. You will surely be astounded by the fine services and facilities at the handful of high-end hotels that are a quick drive away. Great choices are the Göbel's Vital Hotel and Romantischer Winkel SPA & Wellness Resort. Visit Walkenried Abbey and have a taste of monastic life at this sacred place. Dom Zum Heiligen Kreuz is a pleasant and peaceful house of worship. Admire it from a distance or check if you're able to have a tour inside. If you love nature, Harz National Park is a place you're sure to appreciate. Bring the family for a walk in this calming environment. Try the Ring der Erinnerung, where you might enjoy what's on display and discover something new. A trip to Grenzlandschaft and Museum Sorge is an awesome way to learn about the regional history away from the crowded tourist sites. How Much is a Hotel Room in DDR-Museum? Hotels in DDR-Museum start at per night. Prices and availability subject to change. Additional terms may apply. Apartment 1 - Apartments "haus Presse"
Apartment 3 - Apartments "haus Presse"
Apartment 4 - Apartments "haus Presse"
4 Stars Holiday House "piccola Perla"